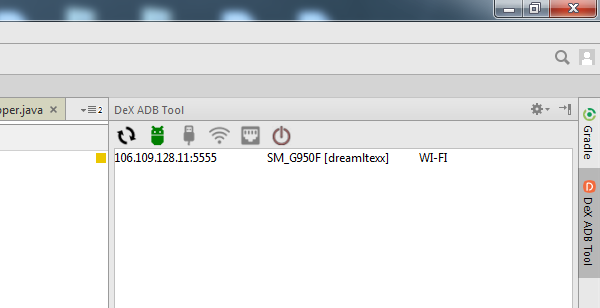 DeX ADB Tool can be used to quickly connect your phone which is plugged into the DeX station to Android Studio over WI-FI or Ethernet and to install, run and debug your applications just by pressing single button while not being connected through USB. DeX ADB Tool plug-in adds a button to your Android Studio Toolbar to connect DeX station to your computer over WI-FI or Ethernet. To use this plug-in, the project opened in your Android Studio has to be an Android project configured with the Android SDK. 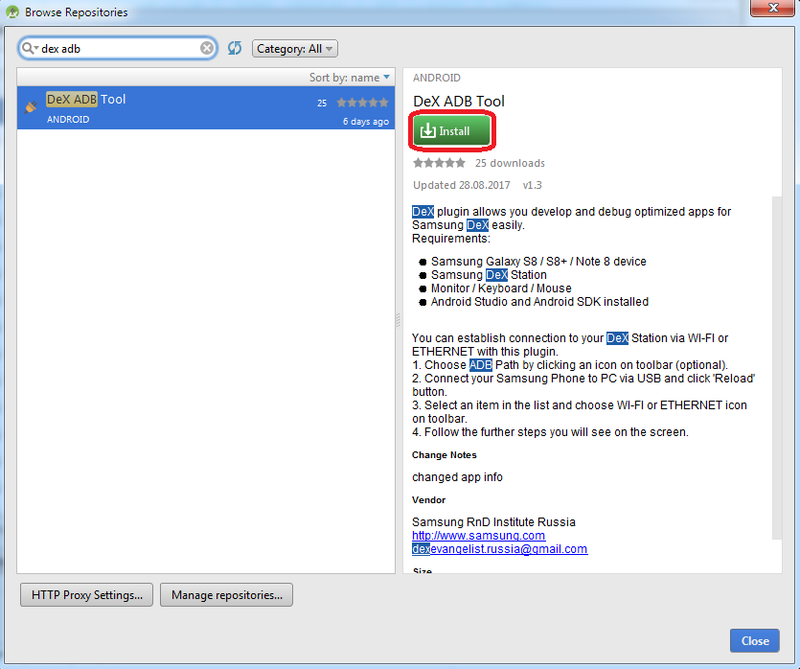 DeX plug-in helps you in developing and debugging DeX-optimized apps for Samsung DeX easily. Samsung Galaxy S8 / S8+ / Note 8 device. Monitor / Keyboard / Mouse. 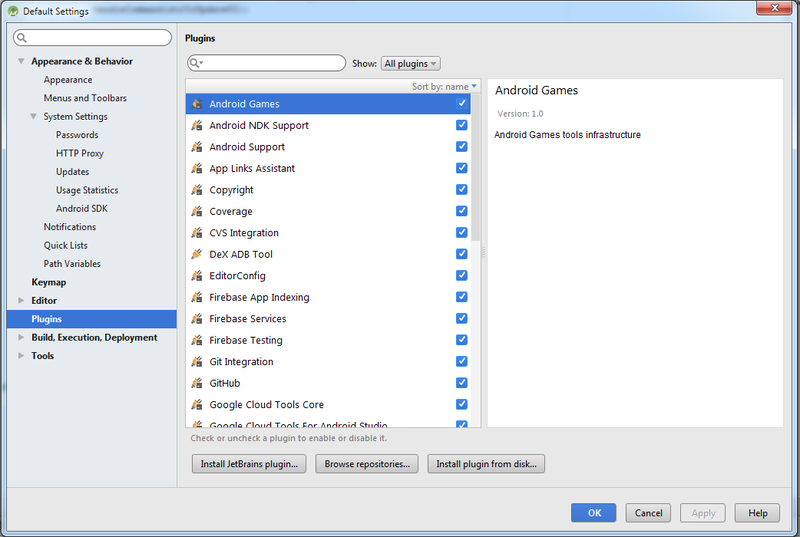 Android Studio and Android SDK installed. You can establish connection to your DeX Station via Wi-Fi or Ethernet with this plug-in. 1. 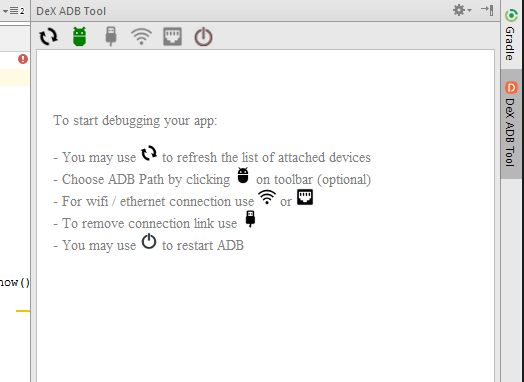 Choose ADB Path by clicking an icon on toolbar (optional). 2. Connect your device to your computer using a USB cable and click an icon to reload device list. You will see after you press ‘Done’ or ‘OK’ buttons. 4. You can now deploy, run and debug your device using your connection. Remember that your device and your computer have to be in the same WI-FI connection. 1. Launch Android Studio and open Preferences. 2. Open the Plugins section. 3. Click Browse repositories to load the full list of IntelliJ IDEA Plugins. 4. Search for the name of the plugin, and click install. 5. Restart Android Studio after the installation completes.